Focused on Making Your Experience Great! When the going gets tough, the tough get going. This is probably a saying you've heard before, a lot, or even something you tell yourself before you face another day of hard work. For you, that's not just some phrase that gets dropped haphazardly with no meaning behind it-it's part of what defines you and your lifestyle, getting things done that others would shy away from, getting the tough things done because they are worth doing, and taking pride in a job well done. But more often than not, you can't do it all alone. You need the right team and the right tools. And most importantly, you need the right truck for the job. When it comes down to reliable capability and dependable longevity, no other pickup compares to the caliber of a RAM. Built with the kind of power to tackle the most brutal of challenges, RAM trucks face the toughest work without flinching and keep coming back for more. Their outstanding capability is cemented as a budding legend as champions of the likes of the Canadian Truck King Challenge-the RAM 2500 taking first place in the ¾-ton category for the past 2 years in a row, and the RAM 1500 taking the crown as overall winner for its third year (2014, 2016 and 2017). With the stringent criteria that tests trucks across all brands in over 20 categories including towing capacity, off-road capability, fuel efficiency, and even comfort, the Canadian Truck King Challenge puts pickups to the test in grueling real-world situations on some of the roughest terrain Canada has to offer. With RAM dominating the competition, it's clear to see which truck is best suited to get the job done, in the same conditions we face right here at home. So where is the best selection of used trucks around? Come to Bustard Chrysler, where we not only have a wide variety of pre-owned RAM trucks but amazing deals that will put a smile on your face. 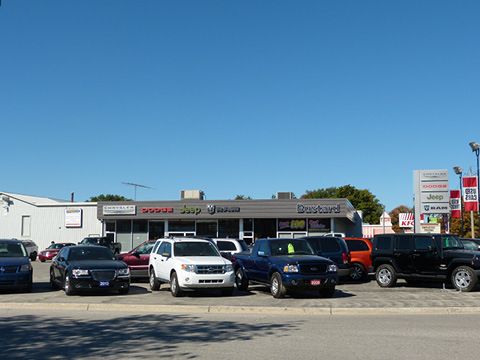 Located in Waterloo, ON, just around the corner from Kitchener, we offer thoroughly inspected, as well as certified pre-owned, quality RAM pickup trucks that will serve you right. From no Hidden Fees to 24/7 Customer Service - You're in Good Hands! We Believe in Being Involved in Our Community - From Charity Work to Events - You'll See Us Around! Award-Recognized Efforts are Just One Part of What Makes Bustard Chrysler Your Dealership Home - Learn More at Our Store Today! Going with used or older RAM 1500 models inevitably makes one wonder about the real value you get out of it. Aside from the great deal from purchasing it used, you also get the kind of truck that gets named winner of Consumers Digest's "Best Buy" for the 2017, 2015, 2014 and 2013 model years. That's remarkable value that is proven by a track record of excellence in owner satisfaction. 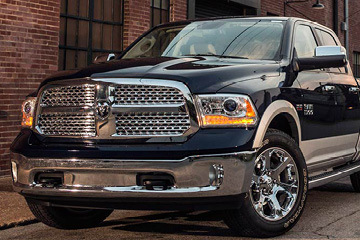 Choose the RAM 1500 as your next used truck! So what kind of power fuels the likes of the 2017 Canadian Truck King Challenge champion? None other than the legendary 5.7L HEMI® engine, packed with an incredible 395 horsepower, 410 lb-ft torque and an astounding max towing capacity of 4,826kg (10,640lb)! 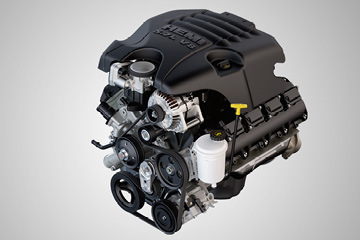 With this kind of power to play with, is it any wonder that the 5.7L HEMI® is Canada's Best-Selling V8 engine? 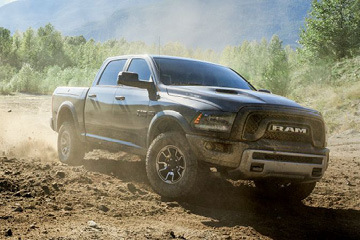 Power your RAM 1500 with HEMI and dominate any challenge you have to face! With any truck you drive, new or used, you want to get the most out of it, and that means durability that you can rely on. That's where RAM shines-as Canada's longest-lasting line of light-duty pickups, you know you can count on it for the long run. And that's not just talk-look at the past 28 years of all light-duty trucks sold, and you'll find that 81% of RAM pickups are still on the road today! That's more than any competing truck, and nearly 3 decades of dependability. Make your truck a RAM, and it's there for you for the long haul. Getting the most out of your pre-owned truck means making sure it stays in peak condition for as long as possible. That's where Bustard Chrysler comes in-we're not just about selling trucks, but keeping them in top shape for as long as you need them. With our expert team of manufacturer-certified technicians, we are fully equipped and able to keep your ride working as well as the day you bought it. Choose Bustard Chrysler, and we're there with you for the long haul. There was a time not long ago when people were more hesitant to buy from someone they didn't know. There were more towns, fewer cities, and townspeople knew one another. Word-of-mouth was the primary form of advertising, and for automobile retailers, reputation mattered. In fact, reputation was everything. People were unlikely to purchase a vehicle from a dealer unless their father or brother or aunt or workmate had already done so, and with a good experience. 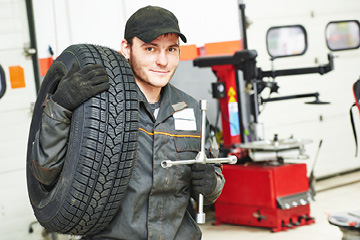 A vehicle would eventually need servicing, and parts, and there might not be another dealership of the same brand for miles. So, trust was necessary. Relationships were everything. That was then and this is now. With decades upon decades of providing superior service we like to say that the proof is in the pudding: Several Bustard family members still work at the dealerships; 15 Bustard employees (in addition to family members) have tenure of 10 years or more; and a substantially higher-than-industry-average percentage of Bustard's business is repeat business - the result of building relationships and keeping promises over time. "If you really stand behind something, put your name on it." Come down and find out what our team can do for you! Bustard Chrysler took away a good 90% of the stress in buying car. The staff was fantastic and extremely helpful. Sean, Kyle and Steve in particular were absolutely amazing! They were very patient and clear with what the steps were and overall, I was extremely happy with the whole process! They went above and beyond making sure I was good with everything and made me feel comfortable. I highly recommend Buster Chrysler for anyone buying new or used car! Very happy with the Service I received here. I know my cars pretty well, had been watching for a 2013 RAM on Autotrader, the pricing here at Bustard is spot on, it was a really good deal, so when it came up I went immediately to see it and it was a Laramie. The Sales guy (Kyle Costa) was fantastic, truck was ready and waiting when I got there, it was a hassle & stress free / easiest purchasing experience ever, really impressed. Truck was immaculate when picked up, and they went above and beyond and covered the maintenance items to bring the trucks maintenance record up to date. Summary: Great pricing, great trucks, great salespeople & financing team - thanks Kyle! We just completed the purchase of our second truck from Bustard Chrysler Waterloo. We had the pleasure of working with Kyle Costa for both truck purchases. Kyle's knowledge and customer service was nothing short of exemplary. Whether it was in person, on the phone, or via email, Kyle was able to answer every question we had from start to finish. Even after the sale, Kyle has continued to provide excellent service and support anytime we've had an inquiry. It was refreshing to deal with someone so honest and transparent throughout both sales. Kyle didn't just sell us a truck, he took a legitimate interest in what we were looking for and worked hard to create a relationship with us. I would not think of going anywhere else to purchase another vehicle. I would highly recommend Kyle and the entire team at Bustard Chrysler to anyone looking for a stress free and no-nonsense vehicle purchase experience.